Several individuals of Antedon bifida attached to a kelp stipe, photographed by Bernard Picton. 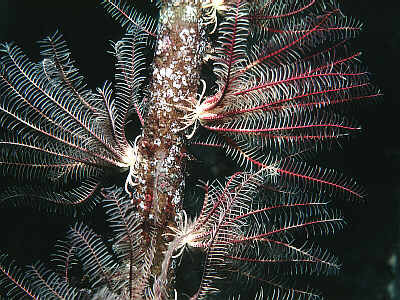 The feather stars and other crinoids are both the most divergent and least known of the modern echinoderms. This is the second post here at Catalogue of Organisms on modern feather stars; an earlier post gave a brief overview of some of the details of the feather star lifestyle and anatomy. The main subject of the earlier post was the family Charitometridae; this post will focus on a different group, the Antedoninae. Yes, Virginia, there are different varieties of feather star. The Antedonidae and related families differ from most other feather stars in that the internal cavity of the centrodorsal, the plate that forms the base of the calyx (central cup) of the feather star, is relatively large compared to the centrodorsal's diameter (in life, this cavity has organs nestled in it). When the antedonids were reviewed by the American echinodermatologist Austin H. Clark (Clark & Clark 1957*), he regarded this difference as significant enough to treat the antedonids and related families as a separate group, the Macrophreata, from other families in the Oligophreata with only a small centrodorsal cavity. However, later researchers have downplayed the significance of this distinction (e.g. Wienberg Rasmussen 1978), and even the monophyly of the Antedonidae has been questioned. Well-developed muscular articulations in the upper part of the calyx also indicate that antedonids are generally stronger swimmers than other feather stars (Meyer 1972). Clark & Clark (1967) divided the antedonids between six subfamilies, but Ailsa Clark commented that the distinctions between subfamilies were not always clear. *Austin Clark's epic revision of the living crinoids was left incomplete after his death in 1954, until it was taken up by the British researcher Ailsa Clark (no relation, as far as I've found). The section of Clark's monograph on the 'Macrophreata' therefore made its debut under both researcher's names. Specimen of Dorometra photographed by Lyle Vail and Anne Hoggett. The page linked notes that this species swims actively when disturbed, before 'holding their arms above the disk to form a shuttlecock shape and then plummeting towards the bottom'. The Antedoninae generally differ from other antedonids in having rather short cirri (though the Philippine species Eumetra chamberlaini has exceptionally long cirri, up to about a third of the length of its arms). The cirri are also rounded dorsally, without dorsal spines or ridges, and most species lack ventral spines except one on the penultimate segment of the cirrus that opposes the terminal claw. The centrodorsal is low and rounded in the majority of species, though it may become raised and closer to conical. 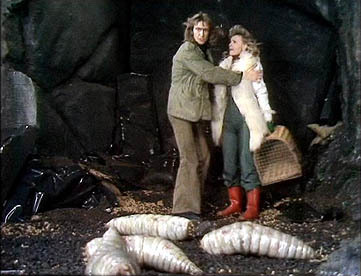 Antedonines include some of the shallowest-living of recent crinoids, with some species even found in tide pools; the deepest-living antedonines are known from 932 m. Clark and Clark (1967) recognised ten genera within the Antedoninae; a fossil genus Palaeantedon (from the Eocene to Quaternary) was listed in addition to the Recent genera by Wienberg Rasmussen (1978), and an eleventh Recent genus Ctenantedon was described by Meyer (1972). The rosy feather star Antedon bifida and the Mediterranean feather star A. mediterranea are among the best-studied of all feather stars, primarily due to both being found in shallow waters around Europe. However, the greater diversity of antedonines is known from the Indo-Pacific. Apart from species of Antedon, the only Recent antedonine known from the Atlantic is the Caribbean Ctenantedon kinziei (the fossil species of Palaeantedon are also Atlantic). Characters used to distinguish genera include features of the pinnules, the slender side-branches of the arms. Antedon species, for instance, usually have the second and third pinnules on each arm similar in size to each other, and both distinctly shorter than the first pinnule. Ctenantedon kinziei is unusual in having a comb of 'teeth' developed in the distal part of the proximal pinnules. 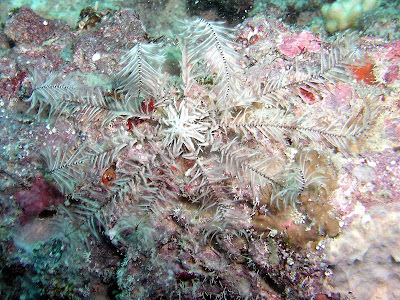 The function of these teeth is not entirely certain, though Meyer (1972) noted that he had observed the oral pinnules of comasterid feather stars (which also bear similar teeth) moving in and out from the central disk in a manner that suggested they were being used to remove undigested food and other waste material. Clark, A. H., & A. M. Clark. 1967. A monograph of the living crinoids. Volume 1. The comatulids. Part 5—suborders Oligophreata (concluded) and Macrophreata. Smithsonian Institution, United States National Museum, Bulletin 82. Meyer, D. L. 1972. Ctenantedon, a new antedonid crinoid convergent with comasterids. Bulletin of Marine Science 22 (1): 53-66. Wienberg Rasmussen, H. 1978. Articulata. In Treatise on Invertebrate Paleontology pt. T. Echinodermata 2. Crinoidea (R. C. Moore & C. Teichert, eds) vol. 3 pp. T813-T927. The Geological Society of America, Inc.: Boulder (Colorado), and The University of Kansas: Lawrence (Kansas). While morphological disparity is not really an objective measurement, it seems to me that sea cucumbers, especially some of the abyssal and pelagic ones, are much more different from the echinoderm common ancestor than any crinoid is. Ah, but the adjective I used was 'divergent'. 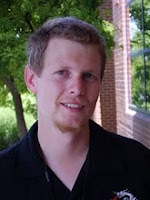 I also said nothing about measuring from the echinoderm common ancestor. Why Are There So Many Avahis?